This week Facebook/Oculus unveiled their read-for-prime-time consumer headset. It’s expected to hit the market in the first part of 2016 (pre orders start this year)…if you can afford it. Wired reports that “when paired with all the PC hardware needed to run the headset, it will sell for less than $1,500.” Translation: by the time you upgrade your PC hardware and buy the headset, you’ll be in for some serious money. 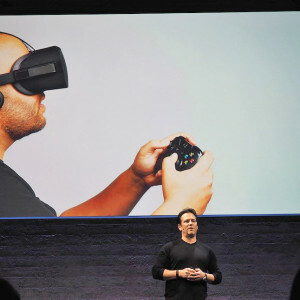 Oculus also announced a new controller (it’s never had one before). It doesn’t sound like it’s going to be in included with the headset but tech sites were abuzz at how awesome it is—it likely helps that up until now, controllers were all retro fits of other tech. This is the first one designed specifically for the Oculus. When Mojang, the maker of Minecraft, was bought out by Microsoft it took the whole tech world by surprise—including those who worked there. Wired has a book excerpt that gives a behind-the-scenes look at what went down. If you love drama and/or Minecraft, you’ll enjoy reading it. Monday, Apple’s new stuff dominated the tech media. Some of the biggest news: the ability to multitask do a split-screen on an iPad for easier multitasking, 6-digit lock codes for newer devices, a “move to iOS” app for any Android fans who want to defect to Apple, and as expected, Apple announced their own streaming service called Apple Music (did you really think it would be called anything else?). For a bit more highlights, check out The Verge’s recap called, “The ten most important announcements from WWDC 2015”. In what came as a huge surprise to employees and the tech world alike, Costolo announced yesterday he is stepping down as CEO. His last day will be July 1 and Twitter founder Jack Dorsey will be the new interim CEO until the board decides on a permanent one. According to his email announcement, he told the board last year they should start thinking about succession planning so it seems he’s been thinking about this for a while. Costolo is staying on the board though, and in a Business Insider interview he was just ready to move on from that role (and BI says antsy investors may have helped precipitate his departure). And in other Twitter news, next month you can direct message over the social network with up to 10,000 characters, instead of just the usual 140. After the Fukushima nuclear disaster, DARPA launched a robot building challenge to the world—create one that can walk, get out of a car, climb stairs, make it over over rough terrain, and do some basic tasks. The winning team, KAIST, managed to get their robot to complete all the challenges….slowly, but surely. Here’s a fast-motion video of it of completing all the tasks. In an answer for all the gamers who wished Xbox had more internal storage, shipping June 16, is new 1TB version of the popular gaming console. Sony says it will retail for $399 and will be distinguished from its Xbox peers by a matte finish. Sony is also introducing a new wireless controller, shipping standard with consoles moving forward. Also, addressing owners who wanted more accessories, Sony is also introducing a wireless controller. Equally good news? The price on the 500MB consoles will drop to $349 immediately. This has absolutely nothing to do with tech. In fact, it’s almost the antithesis of tech. But, it although it’s been out on the web for a few months, it went totally viral this week. If you have seven minutes to spare today, do recommend it (with maybe some Kleenex near by, if you’re a crier).